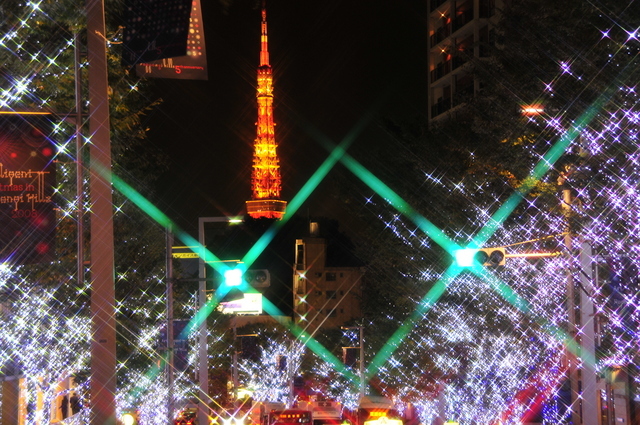 Does Santa’s sleigh make a stop in Tokyo and Hokkaido? Of course it does! But what about turkey, presents and Christmas cards? 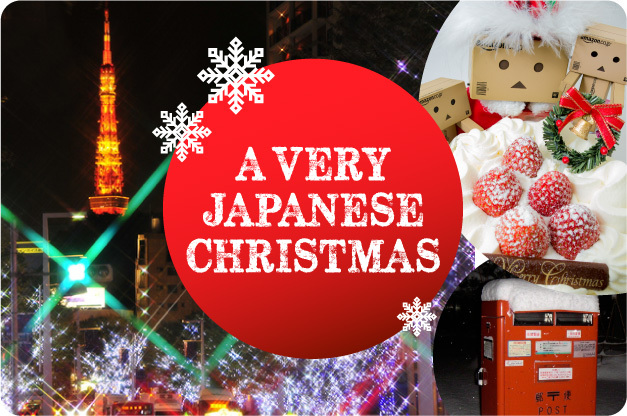 Come bask in the warmth of the twinkly lights and pine tree scented knick knacks, and learn all about how Japan makes Christmas very merry indeed! Of course Christmas time is filled with good wishes for all and love for others! In Japan, this love for others can be quite specific (or you could be in trouble!) Similar to Valentines Day in the West, Christmas is a very romantic occasion in Japan for many and couples commonly meet to enjoy a special meal and exchange gifts. Particularly popular date locations are illuminated gardens and boardwalks, as well as festive theme parks that go all out for Christmas. However, as the more formal New Year gift giving tradition called o-seibo is falling out of favour, families and friends are often opting to arrange informal get togethers or gift giving at Christmas. Turkey? Give me Kara Age! Ovens are not very common in most Japanese homes so producing a turkey with all the trimmings becomes a major production! Japan still celebrates in style with… fried chicken and strawberry shortcake! Chicken is so popular that stores take bookings well in advance, and those that don’t keep to their allotted time risk losing out on Christmas dinner altogether. Work it Postie, Work it! 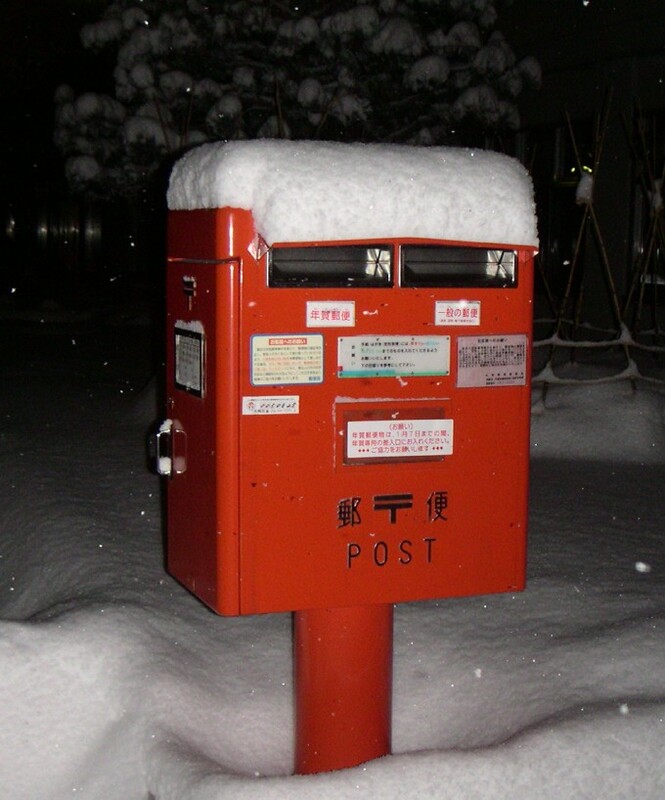 You might think that if o-seibo is getting less popular and most Christmas gifts are given in person, then Japanese posties might be able to take it a bit easy over the holidays. No way! Christmas card exchanges are not really as popular as else where in the world, but Japanese people still let friends and acquaintances know they’re thinking of them with nenga-jyo. These traditional New Years greetings are very much a part of Japan’s winter celebrations and with exhaustive lists of friends and family to send salutations to, it can be quite a lengthy process. And to get you in the mood…. If this has inspired you to add a touch of Japanese cool to your wintery festivities, why not whip up some kara age fried chicken? Or show someone special you’re thinking of them with a little bit of Japanese elegance or something a bit stronger. Thanks to mdxdt at Flickr for the snowy postbox image. 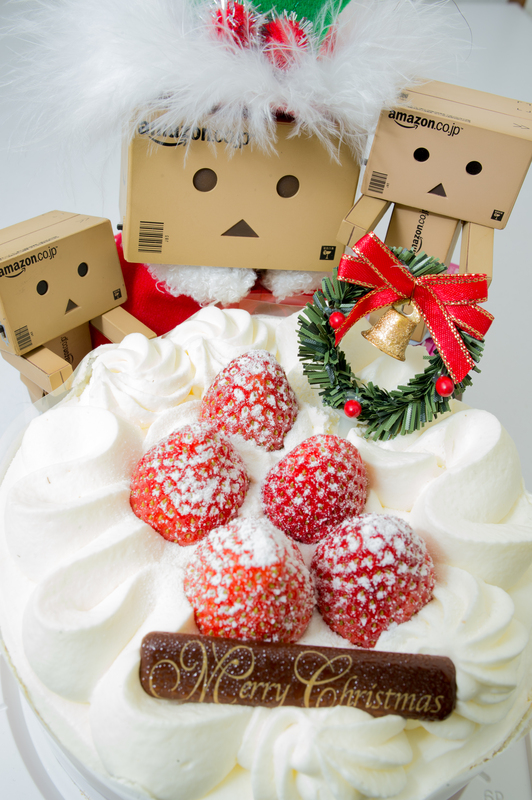 Thanks to takashiaes256 at Flickr for the Danbooru and Christmas cake image. Posted in Food and tagged customs. Bookmark the permalink. Bigger and Better Rice Subscription! Never Forget Your Rice Again! Ring in the New Year with Mochi Pounding at Japan Centre!